HomeCommentaryBeing Harassed by Religious folks who are misinformed… Why they are so so wrong. June 5, 2018 Commentary, Connection, Demons, Discussion, Evidence, INCREDIBLE, Spirit Communication, Talking to the Dead, Uncategorized Comments Off on Being Harassed by Religious folks who are misinformed… Why they are so so wrong. Being Harassed by Religious folks who are misinformed.. why they are so so wrong. They have NO IDEA about the realities of what I do, or what it truly says in the Bible about what I ands many others do who have been blessed with a gift of love. YES LOVE! That is what this is all about, GOD and LOVE as GOD = LOVE. My life, especially since my vision and acceptance of GOD within my soul (GOD is within us all, always has been, we have to recognize it to harness it) has been filled with nothing but HAPPINESS. I AM AT PEACE. I AM SERENE. I AM FULL OF LOVE, ALWAYS HELPING THOSE AROUND ME WHO NEED IT, and helping the living with my work, as well as souls who ask for help. In fact, it’s right in the Bible. Jesus himself talked to the dead, three times. The Bible actually does not forbid what I and others do (to some extent) but in order for that to sink in, and understand that, one must truly read the Bible and all it says about it. What I do is NOT necromancy, as defined back when the bible was written. 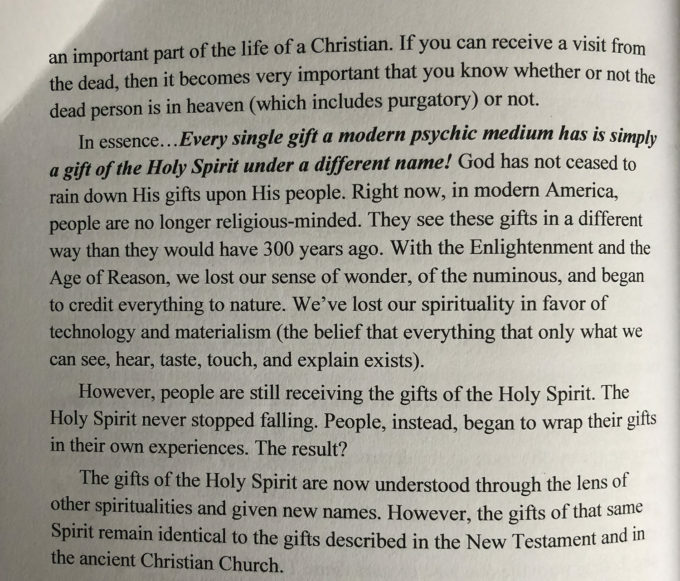 Back then, the only form of contacting the dead that was forbidden, as defined in the Bible, is to summon spirits against their will for the sole reason of getting information about the future. Using blood, spells, and dark magic to do so. FORCING them to be conjured up to give info about future details. No, that is not what I do at all. What I do, again, all comes from LOVE and is for the purpose of LOVE, which is why the spirits mention God, Jesus and Love often. Don’t believe me? I will make it easy for you, buy and read THIS book, front to back. It uses religion, all versions of the Bible, and facts to spell this out with 100% proof and fact. It seems many just regurgitate what is said by the church or what they “heard” the bible says. No one seems to do the research for themselves. The proof is in the evidence, especially in my most recent videos. Spirits calling out for Jesus, loud and clear. 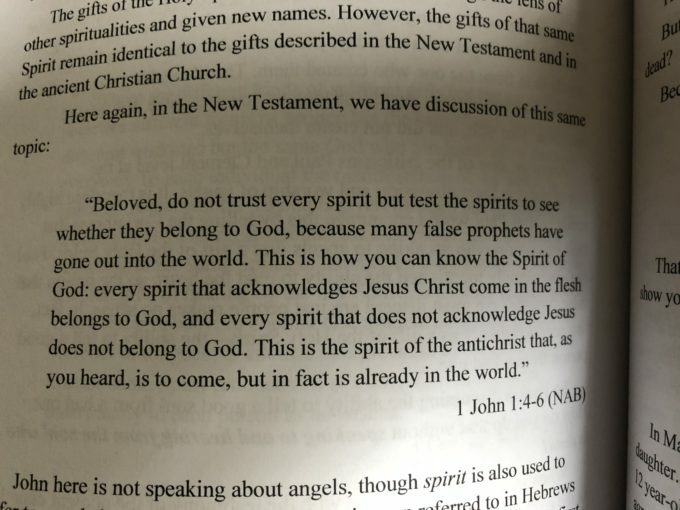 Spirits saying they were SAVED by Jesus, loud and clear. Spirits asking for GOD, and LOVE and the LIGHT. Yet some overly religious folk who do not even really know the Bible, just send harassing emails to me with predictions of all of the nasty things I have spoken of. Predictions that of course have NEVER EVER come true. It is very sad to see the hypocrisy among those who claim they follow God and Religion as some of these people are flat out mean, angry, agressive and have hate in their heart. 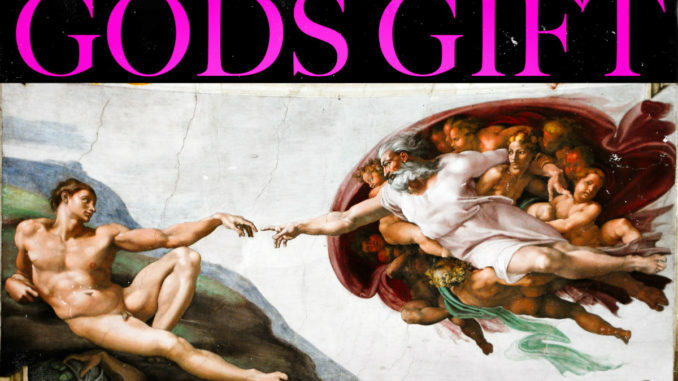 That doesn’t sound very “God Like” to me. I used to be told by some of these people … “I DARE YOU TO CALL OUT JESUS IN YOUR SESSIONS! 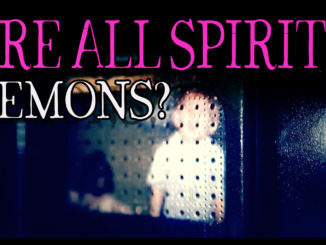 THE SPIRITS WILL SCREAM AND RUN AS THEY ARE ALL DEMONS”!!! Well guess what? Not only did they not run when I did that, these spirits embraced it and now call them out themselves. They mention God, Love, Light and Heaven all the time. 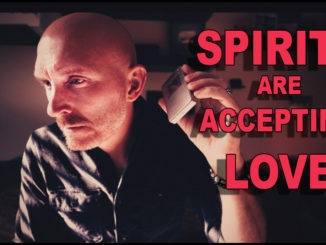 When an occasional evil spirit slips in (and they ALWAYS tell me when they are here and are not shy about it), it is easy to get rid of them with a simple prayer at this level of communication. So once again, those Religious folks who harass me have been proven wrong, as they have been over and over again. But now that they have been proven wrong they change their messaging. These days it is “NOW YOU ARE BEING FOOLED, ITS THE DEVIL ACTING IS IF HE IS GOD”!! Well, sadly you can not have it both ways. First you tell me evil will scream and run at the mention of God and then you tell me that now they are just saying they love God. You can not just change the narrative to fit your warped belief. It doesn’t work like that. Sorry but I go by real world evidence and reality. It is as crystal clear as a sunny day. What I do here is not wrong at all but some religious folk seem to look for the negative in everything. In fact, not only do I feel that this is allowed by God and I feel it has been gifted to me by God as there is no other way to explain the results, the love, peace, harmony and calm that has entered my life since I accepted God into my soul and have become spiritual. When I see these types of skewed messages inside my inbox or in YouTube comments I do no feel bad for myself but I do for those who are putting out that negative message. They go out of their way to be negative, angry, sometimes nasty, and some under the guise of being helpful. If these people and their statements were true, I would have been dead years ago. I would have lost it all years ago. I would be hateful, spreading hate. I would be suicidal. I would be broke. I would be alone and lonely. None of which is even close to being true. Not even 1%, not even .0000001 true. Yet those who email me these things seem to be down in the dumps themselves so it really gets me thinking. I pray for these individuals each time I see an email like this. They really can not be fully happy or at peace with their life (if they were they would not be harassing others). Again… I am full of love, happiness, peace, financially stable, never raise my voice to anyone, and am living a happy, peaceful life. Huh, goes against everything they say doesn’t it? But that is OK, as that is how they were raised, what they were led to believe…that contacting the dead is BAD! We can’t do that!! But yes we can, and God has given some of us the gifts to do this, which is why there are mediums, which is why there are those who help solve crimes using current technology and why some like me can do what we do. With amazing validations of love. So those who do this, and send emails or tell you that you will go to hell for this, are well, uninformed about the facts and truth, and for some, by no fault of their own. YES!! I AM WELL. I AM HAPPY and I love what I do. Happiness does not come from money, success or material things. It comes from LOVE and an inner peace which I have had for a long time now. I repeat…MONEY, FAME, SUCCESS, MATERIAL THINGS, SOCIAL MEDIA, ATTENTION does NOT equal happiness as those are all addictive things, and I try to avoid things such as social media (I am on facebook 2-3 time per week for 5 minutes, just to post and answer people. I really truly dislike facebook). Instead, those who are unhappy chase those things, not realizing that happiness can be found by realizing that GOD is within us all, and yes, GOD loves us. No, I am not religious, at all. I am spiritual and I Go by reality, and evidence and 1st hand experience. I do not follow man, I follow God and what he has shown me. What I have been shown is to speak of Love, to speak of our souls and what can happen when we accept love over hate. To show proof of this. Yes, God=Love. My life wasn’t always like this though. In fact, during the 15 years before I started this work, I was angry. I was negative. It was killing me inside. I was always stressed, hated what I did for a living, had a marriage full of tension. When I started this research, my life changed for the better in every way from financial, to love, to well being, to happiness and stress went away. When you have that knowing inside that we never die and there is truly a GOD and a HEAVEN and a HELL, it changes your whole outlook on life. If I did NOT start doing this work, and I hate to say this, I probably would have done harm to myself at some point as my depression was DEEP for a year or so before starting to research life after death. So doing what I do has truly saved my life and my mental stability. THAT is yet more proof. Why would demons pull me from a dark place and save me, and make me happy? Happier than I have ever been in my life? Why would they have me talk of love, God and Heaven and allow me to PROVE what I say is real? Hmmm. Why would they push me to say LOVE is the KEY? Why would darkness promote light? Hmmmmm. So to all of you who email me with these negative messages, and think you are doing good? You are not. You are not representing the Bible. Believe me, READ THIS BOOK. Cover to cover. Then you can do your own research using words of the Bible itself and see that Jesus himself talked to the dead. He wanted us to live by his example. LOVE being the KEY of course. It is all mentioned in the Bible that we should also PRAY for the dead as Jesus did. Today I pray for lost souls, I pray for the living. Today I help the living and have even stopped a few from committing suicide due to this beautiful gift I have been given, BY GOD. Satan or Evil would NEVER allow someone to do this and push love, peace, harmony and use it to save lives, and bring others out of depression. If you think that is the case, you are lost my friend, truly. Please see the truth for what it is. LOVE=GOOD=GOD. This is all I do, and push out in my messaging. With all of this being said, I will state that yes, there are EVIL spirits. There are DEMONS. There is a HELL. I have recorded them, and evidence of it and sadly, today there are those who are so irresponsible with this work, and they seek out evil. Seek it out and it will come. In my experience, Evil….They always will state who they are, loud and clear to me when they come through (though I rarely get one these days). Then there are good spirits and souls, who thrive on love, prayer and guidance. Then there are those who CAN come back and leave messages for their loved ones who are living. Make no mistake, when doing what I do, you do occasionally have to deal with some negative entities. These days though, since allowing GOD within my heart, that has just about completely stopped. I have learned so much doing what I do…it is all a part of my souls journey and I am blessed to be able to experience this. Unless you are in my shoes, you have no idea what is happening. Over eight years, thousands of messages, with many answers to the questions we have always had, well, answered, I feel blessed beyond belief. As the Bible says, when a spirit acknowledges GOD, this is how you know they are the spirit of GOD. With GOD. I get them asking for GOD very often. Jesus. Angels. Prayer. NOT all spirits are demons. If you think that is true, you do not know the facts and are probably too stubborn to do real research to discover the facts. I will be doing this research until the day I leave my physical body, whether that is in a year or in 50 years. NO ONE will stop me, as this is important research and work that is changing lives and can eventually help heal the world. It’s all about THE BIGGER PICTURE and I am being led down my spiritual path, and as a result, my spiritual growth has blossomed, and it is absolutely beautiful. To those who want to stop it, you should maybe consider starting your own spiritual path and embrace love, peace, happiness, and positivity. If yo do not, you may be allowing evil into your life as that is how it starts. Leaving nasty messages for those who push love and positivity means you have some pretty strong negativity within YOU. What I am doing here is just the beginning. One day, long after I am gone the world will be a beautiful place with much more love than hate. Many will come after me and take this even further than I am or have. I have seen this from within. There will be a time when spirits will be accepted as real by ALL as their will be something that takes place that no one can dispute. This is all to come and again, long after I am gone. But we are now at the start of this, and it is a beautiful thing. I guess the easiest way to look at all of this is with common sense, which we all have. Here you have a guy (me) sharing my nine years of experience of being very deep into afterlife research and communication. Here I am, eight years later and what is happening? I am spreading the message of LOVE, happiness and positivity. I am recording clear spirit voices, speaking in full sentences, talking about Jesus, God, Love and prayer. I have no negativity in my life, at all. I have no unhappiness, at all. I am at full peace with myself and have helped many on this side and the other, all in the name of LOVE. I have helped others who were gong to take their own life until they saw my work, and have pulled some out of depression. I have helped many out of depression by bringing messages to them from the other side. 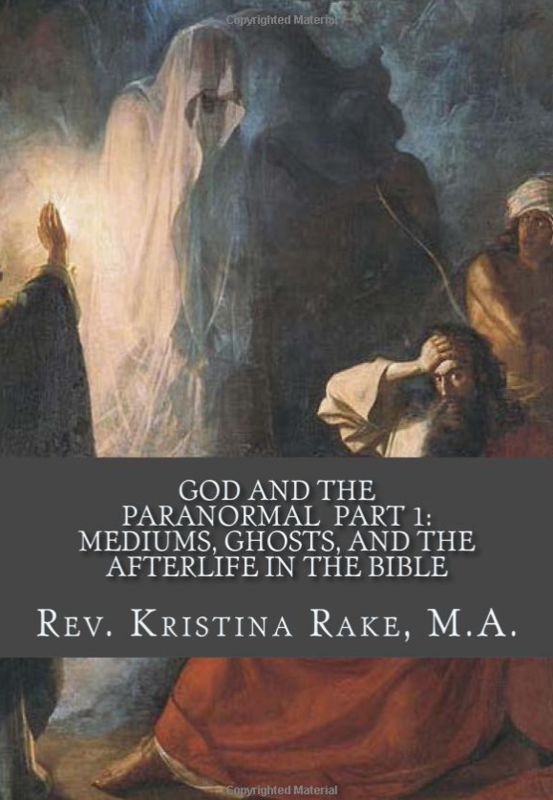 This research is doing ONLY good for me and those who accept that GOD is within us all. That is after all, what Jesus wanted is it not? LOVE! This is why I always say that LOVE IS THE KEY. Remember that as it is truer than you can ever imagine. Love to all, thank you all. Spirit says he Sees Jesus. Real Time Direct Communication you can HEAR. April 29, 2018 DR60, E.V.P., Ghost, Ghost Box, Patreon, SCD-1, SCD-2, Spirit Communication, Talking to the Dead, Wonder Box Gold Comments Off on Spirit says he Sees Jesus. Real Time Direct Communication you can HEAR. May 23, 2018 Apparition, Apps, Crossing Over, Demons, DR60, E.V.P., Evidence, Evil, Fear, Ghost, Ghost Box, INCREDIBLE, ITC, SCD-2, SOULSPEAKER, Spirit Communication, Talking to the Dead, WONDER BOX Comments Off on Are all spirits EVIL? I ask them, and the answer may surprise you. HEAVEN IS REAL…or so says the spirits. AMAZING CLEAR Session with the Wonder Box and Vortex. 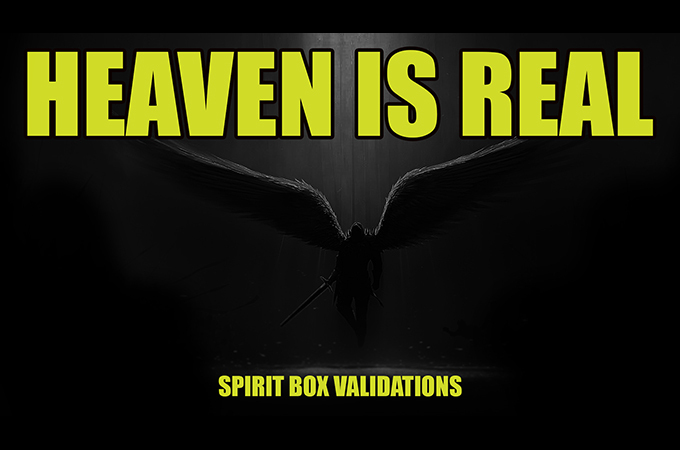 April 15, 2017 Ghost Box, Research, Spirit Communication, WONDER BOX Comments Off on HEAVEN IS REAL…or so says the spirits. AMAZING CLEAR Session with the Wonder Box and Vortex.